Pacquiao vs. Marquez will go down as one of the great boxing rivalries of all time. Take any of the epic counterpart match-ups, Sugar Ray Robinson vs. Jake LaMotta, Micky Ward vs. Arturo Gatti, Muhammad Ali vs. Joe Frazier, choose any one you want and this one is worthy of being in the discussion. Before last night Pacquiao held a 2-0-1 advantage and each fight had gone to a decision. An argument can be made however (and has by many) that Marquez should have been the one with the 2-0-1 lead. Marquez’ definitive victory last night was the first time one of these fights has ended with a knock-out and added a twist to the rivalry, leaving many onlookers wondering if the evenly matched fighters would square off yet a again. Manny Pacquiao was leading on all three judges scoring cards by an identical score of 47-46 when Juan Manuel Marquez put an abrupt end to perhaps 2012‘s best fight in stunningly ferocious fashion. Marquez caught Pacquiao with a counterpunch, a perfectly placed right hand square on the nose, knocking the Filipino superstar out cold at 2:59 of the sixth round before an arena packed with his feverish Mexican fans. 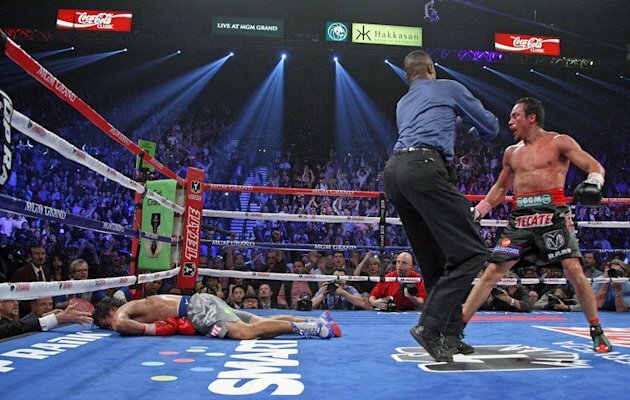 As Marquez and his fans celebrated with Pacquiao laying face down on the mat, somewhere Floyd Mayweather Jr. had to be watching in disbelief and kicking himself. Mayweather, the world’s top boxer in the eyes of many, failed to sign for a fight with Pacquiao that would have been the richest bout of all-time, haggling over seemingly minor issues. The boxing world has been clamoring for the fight for years but, the two parties for some reason have been unable to come to terms. While a Pacquiao-Mayweather fight can still happen, the stakes wouldn’t nearly be as high now and the potential purse the fight would generate would be a fraction of what it could have been. Pacquiao was doomed from the start as he received a pep talk before the fight from defeated U.S. Republican presidential candidate Mitt Romney. Who gets a pep talk from someone best known for losing on the biggest stage? Isn’t the point to hear something inspirational from a winner?